As a parent, you’ve always had high hopes for your progeny. You’ve imagined all sorts of futures and done what you can to give them every opportunity to grow into the adult that they wanted to be. Perhaps you had a few extra guiding words. You might have preferred lawyer, doctor, or architect to certain other options like pie-eating-contest-winner or video game live-streamer. Maybe you nudged your child in those directions and pulled a few strings to get them into the best school at an early age or hired tutors to ensure that your child had a full time focus on their burgeoning career. No one would blame you for that! Of course, that much focused attention on a single career can occasionally make your tyke go a little schizoid. While you’re trying to create the next real life Doogie Howser, M.D., it is entirely possible that you might have inadvertently given them a little too much passion for their job and things can get way, way out of hand. So, now that you’ve got your own little maniac doctor, there are only a few options. The best we can think of at this point is to give everyone else a clear warning of what they are facing. Dress for the part you want, they say, so here is this Child Demented Doctor costume. 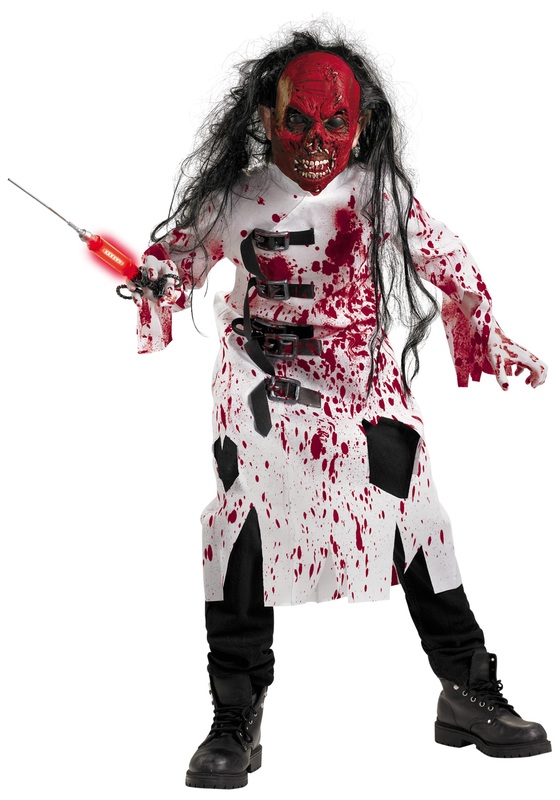 This blood-splattered white robe fastens with Velcro and clearly shows that your tyke has been up to some crazy surgeries! That might be enough if not for the hand prints along it and what appear to be hints of a straight jacket on the chest! Of course, the molded vinyl mask revealing the blooded muscle tissue and wild hair certainly won’t comfort too many. But, still, you still need to give them the tools necessary to move forward, but perhaps suggest a calmer attitude towards medical experiments in the future.